LA HABANA, Cuba, June (wwwcubanet.org) - Belonging to a family that decided to dissent from the current [political] system in Cuba, to aid political prisoners, and to suffer and denounce the violation of their rights and those of their compatriots; can be dangerous, even for a child. Miguel Pérez, 18 years old, has been serving, for the past three months, a prison sentence for an alleged crime of “social dangerousness.” His cousin, Janet Pérez, states that this is [nothing but retaliation] from the government. Both youths are the grandchildren of late dissident Mirta Villanueva. The trial of Miguel Pérez happened in March, and he was sentenced to three years. The family appealed, and the hearing took place on 20 May at the [Ciudad de la Habana’s] Provincial Tribunal. However, neither his family nor his lawyer, were notified. “When I learned that the appeal hearing had already happened—narrates Janet—everything was over. My cousin’s “re-educator” called me on the phone to inform me that now the sentence was two years. I was so distraught and said so many things that he let me speak to my cousin to make things a bit better. He was upset and kept telling me that he had not admitted to anything. They didn’t notified his hired lawyer, and [instead] they had a court assigned one." Janet remembers that during the first trial, the [hired] lawyer, during a recess, scolded her for not telling him about the “counter-revolutionary” meetings that occurred at the youth’s home. Miguel Pérez is serving his sentence in the Juvenile Prison of El Cotorro, in Ciudad de la Habana’s municipality of the same name. 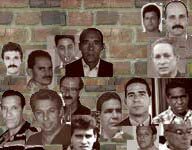 Mirta Villanueva was a member of Partido 30 de Noviembre Frank País [30 November Frank País Party] and worked in the party section for the assistance to political prisoners. Her son, Camilo Pérez Villanueva, was a Cuban intelligence officer who served ten years for opposing the regime. He now resides in Spain, but the family continues to pay the price of dissenting from a political system on which they some time ago believed. Translated by Ernesto at the I Accuse the Cuban Government blog.